Home » Game Reviews » Letting the Good Times Roll: Some Mardi Gras Inspiration for Game Night! Letting the Good Times Roll: Some Mardi Gras Inspiration for Game Night! Written by: KristaG on February 27, 2017. Last September, I got the privilege of going on a trip to New Orleans, Louisiana. While there, I got to explore the rich history, meet amazing and talented people (I got to make a few new friends as well! ), get absolutely blown away by the food, lose myself in the fantastic melodies of many a jazz musician, and even dabble in the darker, more macabre areas of the French Quarter and its surrounding areas. As tomorrow is Fat Tuesday (a.k.a. Mardi Gras or Mardi Gras Day for those that celebrate Mardi Gras for the entire celebratory period before Ash Wednesday), I wanted to relive some of those experiences! 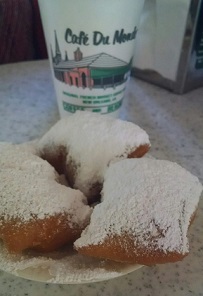 Chicory coffee and fresh beignets from Cafe Du Monde! One of my unquestionably favorite spots to visit during my trip was the famed Cafe Du Monde! Even with the boisterous, chattering crowds, the surprising late night heat/humidity, and the cell phone perusing waitstaff, my mother and I would make the multi-block trip on foot almost every night just to enjoy the fresh beignets and share some chicory coffee or a pint of milk. There are no words to describe how heavenly they are when hot out of the fryer with a heavy dusting of powdered sugar mixed with the bitter flavor of chicory coffee. Oddly enough, it is perfect balance of sweet and bitter and one I never thought I’d like as I’m not a big coffee drinker and bitter coffee is not something I usually enjoy. 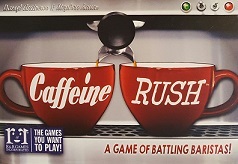 Caffeine Rush from R&R Games! where players take on the role of baristas battling to finish coffee orders in order to earn tips (score victory points) by playing ingredient cards on the Order cards until they are completed. Sounds easy, right? Caffeine Rush is actually played with all players taking turns simultaneously and with only one hand! The other hand must be kept behind their back (we tend to also allow keeping one hand in your lap as some of our players have shoulder issues) and the completed Order (as well as the points) go to player that placed the final ingredient upon the card! Games of Caffeine Rush generally take 10-15 minutes and are perfect for some giggle-inducing fun while my food cooks. A more in-depth review of Caffeine Rush will be available soon to my readers in the following weeks. 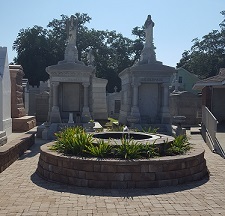 Some of the above ground tombs at St. Louis Cemetery #2. 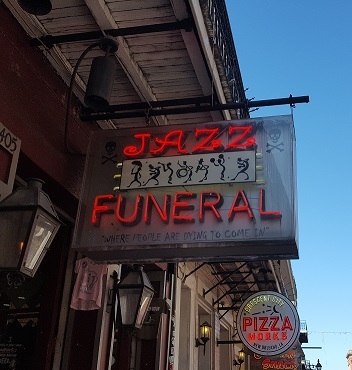 Jazz Funeral – one of my favorite shops! Voodoo shops (Jazz Funeral and Voodoo Authentica being my favorites). After spending nearly an entire day visiting the St. Louis Cathedral, Jackson Square, and wandering the French Market, mom and I, again, stayed out after dark; opting to walk back instead of taking the bus. This time, we indulged ourselves – and, again, my love of the metaphysical – by checking out the buskers and choosing to get tarot and palm readings done! Afterwards, I was able to delve further into my love of the macabre and vampire lore as I listened to snippets of ghost stories being told during walking tours and even found Boutique du Vampyre by pure luck! Voodoo Mania from Passport Game Studios! While there are many, many vampire games out there that could be used to fill the niche that comes with the lore of the French Quarter, Vampire: Prince of the City from White Wolf Publishing being my favorite, none of them really had the true New Orleans vibe that I was hoping to provide on Mardi Gras. Nor do they really fit the feel of the Carnival like festivities. 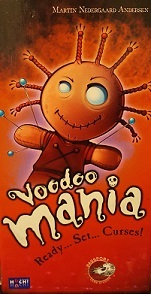 Instead, the first game that jumped out at me was Voodoo Mania from Passport Game Studios! Voodoo Mania is a 2-6 player game that came out in 2013 and has been mentioned several times on this site (my full review can be found here). It is lighthearted card game all about pattern matching. However, instead of finding the items (a.k.a. ingredients) that match, you want to find the ones that don’t! Each card has four out of the five available symbols represented in four out of the five color options and the goal is to be the first one to be able to play a double sided card from your hand that contains the missing and properly colored item. As with Caffeine Rush, this game is played with all players taking their turns simultaneously, but this time there’s no restriction on how many hands you get to use! Though not entirely surprising, there are Mardi Gras masks and beads everywhere in New Orleans available for purchase year round. They range from simple to complex and with varying quality, but masks can be picked up from gift shops, various vendors, and even stores like Walgreens! Out of all of the different styles available, I think my favorites were the French and Italian designs. The Zulu inspired Mardi Gras masks are really cool, too, if you can find them, but they tend to be, in my opinion, much harder to come by on average. Though they make great souvenirs, neither mom or I picked one up. However, while visiting Oak Alley Plantation, we came across a really cool Voodoo inspired top hat that we just couldn’t leave behind! 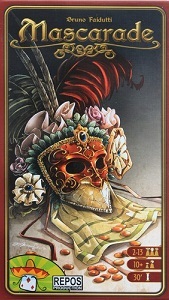 What better game to bring about the feel of a Mardi Gras Masquerade than the 2-13 player game of Mascarade from Repos Production? Released in 2013 with an expansion closely following it in 2014 (ironically called Mascarade Expansion), this is a great game for large groups. One of my favorite things about a masquerade is the mystique that surrounds it mixed with complete anonymity amongst the participants. The game itself helps provide a good sense of that romanticized glamour along with the inclusion of a bluffing mechanic and some role playing so the more players you have, the better the game. Each player is given a character card to memorize and, essentially, act out. In the expansion, more characters are added so there’s more variety and options to mix and match. The goal of the game is to become the first player to earn 13 coins. Though players begin the game with 6, those coins can just as easily be lost as they can be gained! With this collection of games and great food, I am pretty sure I can invoke not only the flavors of New Orleans, but some of the atmosphere as well! 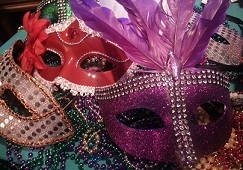 Hope everyone has a great and safe Mardi Gras for those that are celebrating! Until next week, as they say in New Orleans, Laissez les bon temps rouler!